Go, find the hottest stuff here ! During the years from 1758 to 1782 Charles Messier, a French astronomer (1730 - 1817), compiled a list of approximately 100 diffuse objects that were difficult to distinguish from comets through the telescopes of the day. Discovering comets was the way to make a name for yourself in astronomy in the 18th century -- Messier's first aim was to catalog the objects that were often mistaken for comets. Fortunately for us, the Messier Catalog became well known for a much higher purpose, as a collection of the most beautiful objects in the sky including nebulae, star clusters, and galaxies. It was one of the first major milestones in the history of the discovery of Deep Sky objects, as it was the first more comprehensive and more reliable list: Only four or five objects were initially missing because of data reduction errors, which could be figured out later though. 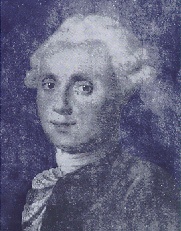 Today's versions of the catalog usually include also later additions of objects observed by Charles Messier and his collegial friend, Pierre Méchain, but not included in his original list. The study of these objects by astronomers has led, and continues to lead, to important, incredible discoveries such as the life cycles of stars, the reality of galaxies as separate 'island universes,' and the possible age of the universe. 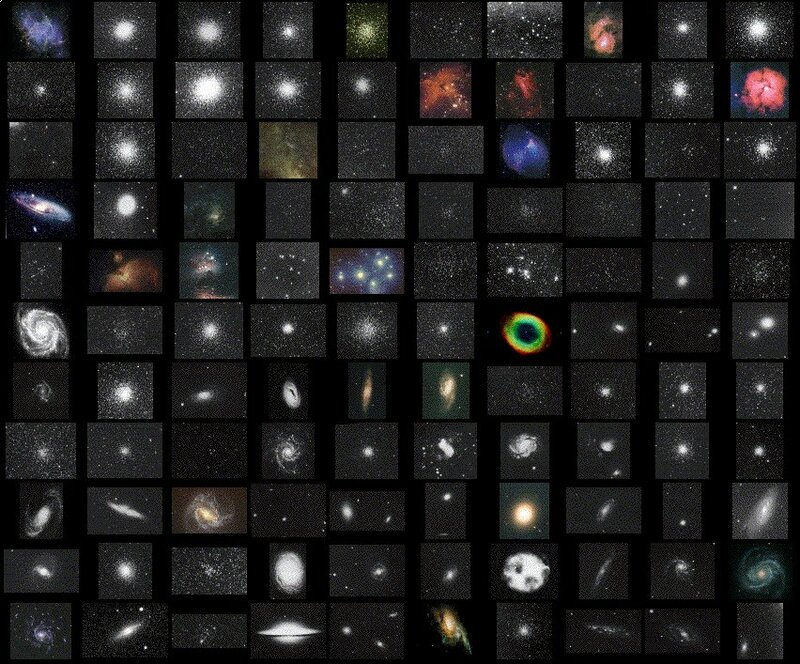 The purpose of these web pages is to provide a complete guide to the 110 objects recognized as the standard Messier catalog. More importantly, we would like to generate interest in astronomy, the night sky and the universe beyond us, and to encourage a sense of wonder and exploration. We also hope that these pages may be useful as a reference for amateur astronomers. For each object, an image is presented together with a short description; click on the image to get a larger-format version. In addition to the images, we have also included some data on these objects such as celestial position (right ascension in hours and minutes [h:m], declination in degrees and minutes [deg:m], both for the epoch J2000.0), apparent visual brightness in magnitudes [mag], apparent (angular) diameter in arc minutes [arc min], and approximate distance in thousands of light-years (kilo-light years [kly] please note that the decimal point in the distance does not represent true accuracy; see explanation of the terms used here). 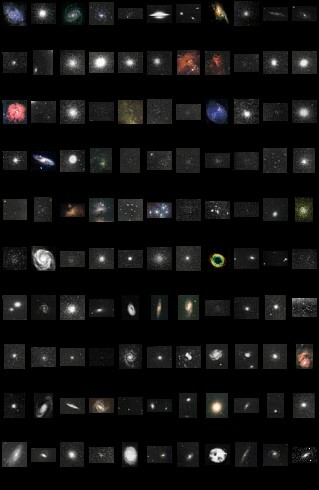 Also, we have constellation images which show Messier and NGC (New General Catalog) objects down to 12th magnitude. Our Messier database has been updated throughout to HTML 2.0, and is steadily evolving into HTML 3. In order to enjoy the full comfort of this HTML level, we recommend to use the most recent release of Netscape (2.01 or 3.X), IBM's OS/2 WebExplorer (1.03, 1.1X, or 1.2), or other HTML 3 compliant browser to view these pages. However, at least for now, we try to restrict ourselves to the strict and pure HTML standards and don't plan to add proprietary features of certain browsers, e.g. Netscape's extras (frames). Moreover, we try to keep the pages appealing (or at least readable) under less advanced browsers such as Mosaic or Lynx; please complain if your browser has certain problems ! We thank all who have expressed interest in these pages, and have sent us e-mail with suggestions and corrections. The contributions of others have significantly influenced what the pages are now. We hope to further approach the state of a top-of-the line resource with in-depth information including object descriptions, "star-hop" techniques to easily locate the objects with small telescopes, and more. If you'd like to help us to improve our database, please also check our request for information list which contains those data which most urgently need to be confirmed, improved, or contributed. These pages were created, with the help of many volunteers, by Guy McArthur, Mark Elowitz, Hartmut Frommert and Christine Kronberg. Hartmut Frommert [contact] is currently maintaining this service and responsible for the current contents (especially any errors). If you have anything to contribute, or find any errors, please contact me. Any constructive feedback is highly appreciated! The original Messier Catalog, (translation to English) and Scans of the original Messier Catalog of 1781 (obtained from the copy of the Bureau des Longitudes, Paris). The Messier pages now have mirrors and translations to other languages (notably a German, an Italian, and a French version); for fastest access, please look for your nearest mirror. Note: Parts of this is still in the making ! 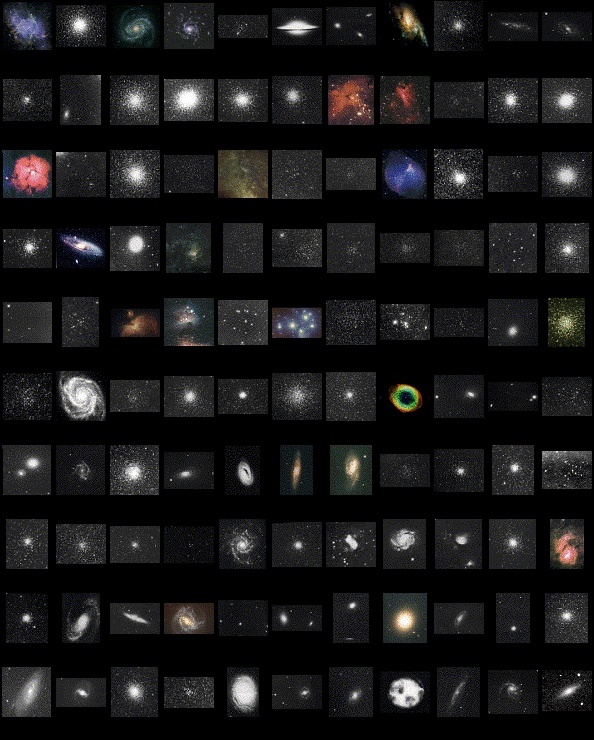 While Messier's catalog was the first major reliable collection of deep-sky showpieces, and without doubt the most famous and important, others have followed since, including similar collections suitable e.g. for the amateur. Learn How these pages were created. The materials in these pages (especially the images) may be freely used for private purpose only; please read our usage regulations page if you intend any other kind of (especially for-profit) usage. Note: Because of massive amounts of work pending, responses to any kind of correspondence may be significantly delayed (nevertheless, your input is appreciated). Also, updates of these webpages are still in slow mode with a long queue of stuff still to be worked in; sorry for any inconveniences this may cause.